Our breeding and selecting work includes many Genus. Here are some of the plants we are looking at. ALLIUM New forms with unique foliage and flower color along with sterility. Looking for rebloom. AMSONIA Red stems and new forms. ANDROPOGON gerardii Selecting red leaved forms and red fall color. ASTER New colors, flower form, sizes and habits. Mildew resistance. ECHINACEA Many extremely short forms, unique petal and cone combinations. 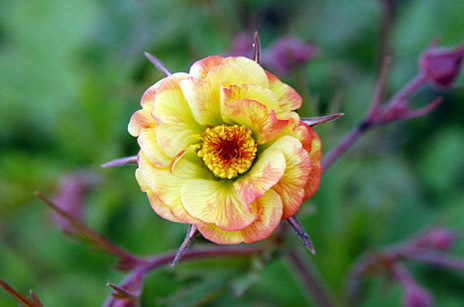 GEUM Breeding for rebloom, new colors and forms as well as longevity in the garden. GRASSES Selections of the following: Andropogon, Bouteloua, Schyzachrium, and Sporobolus. HEMEROCALLIS Pink and yellow bicolors. New extra (dwarf) short forms, less than 12” tall. White flowered with a dark stem! LEUCANTHEMUM Improved form and color, longevity and hardiness in the garden. PENNISETUM Selecting new red flowered forms. PENSTEMON Pink forms with red foliage. RUDBECKIA Disease resistance and yellow color. SEDUM Short habits and dark or unique foliage. Disease resistant. We also have hybrid and selections of the following Genus: Asclepias, Digitalis, Eryngium, Eupatorium, Monarda, Vernonia…And more! Come visit to see what’s new!